Setting the stage for a grand Sooners homecoming weekend, state and local leaders gathered Friday to dedicate a new gateway to the University of Oklahoma and the cornerstone of decades of improvements to the I-35 corridor between Oklahoma City and Norman. Governor Mary Fallin joined officials from the Norman Chamber of Commerce, City of Norman, OU, U.S. Senate and the Oklahoma Department of Transportation to celebrate the completion of the new I-35 Single Point Urban Interchange at Lindsey St. and the unique bridge artwork that highlights Sooner pride and history. Fallin was joined by Norman Chamber of Commerce President and Chief Executive Officer Scott Martin, Norman Mayor Lynne Miller, OU President David Boren, U.S. Sen. James Inhofe, Secretary of Transportation and ODOT Executive Director Mike Patterson to ceremonially unveil the recently completed public art on the new Lindsey St. bridge. The bridge aesthetics are inspired by the Cherokee Gothic style of architecture found on the university campus and the artistic panels on the bridge feature The Seed Sower, the iconic central figure of the OU seal who serves as a reminder of the importance of sowing the seeds of knowledge to bear fruit in the future. The City of Norman partnered with ODOT to fund the bridge aesthetics, as well as new drainage structures. While the new Lindsey St. interchange opened to traffic in July in time for the fall semester and football season, this dedication officially marks final completion of a more than $71 million ODOT project to reconstruct the I-35 interchanges at SH-9 East and Lindsey St. and complete the widening of the interstate to six lanes in Norman. The contract with Sherwood Construction of Tulsa for this project was the largest ever awarded by the Oklahoma Transportation Commission at the time. Work began in 2015 and was completed this summer. A major component of the project included adding new access from the SH-9 East interchange to Ed Noble Parkway and Lindsey St. on the west side of I-35. This new access is benefitting businesses on each side of the interstate and also served as the detour during the reconstruction of the Lindsey St. interchange. Lindsey St. is a prime gateway and major route connecting local businesses and the university campus to I-35. At 337 feet, the new bridge over I-35 is officially the widest in Oklahoma. The new SPUI is only the third of its type constructed in the state and is helping address major interstate congestion and safety issues along this busy corridor. The interchange features longer on- and off-ramps at I-35, a wider bridge and single array of traffic signals on top of the bridge that allow large volumes of traffic and simultaneous turning movements to negotiate the bridge efficiently. Conclusion of this project also marks a milestone for the I-35 corridor in the Oklahoma City metro area. Work began in the early 1980s to widen I-35 from four to six lanes from downtown Oklahoma City to the South Canadian River in Norman. Interstate reconstruction is a lengthy process due to the need to maintain traffic flow at all times while work is ongoing. Since the early 1980s, more than $400 million has been invested in right-of-way acquisition, utility relocation and construction to expand the interstate between Oklahoma City and Norman. Work on the corridor was unable to be expedited as ODOT was reliant only on federal funding for construction statewide until 2006. Construction continues on Lindsey St. west of I-35. A separate project by the City of Norman to reconstruct and widen Lindsey St. to four lanes from 24th Ave. S.W. to Berry Rd. is expected to be completed by the end of this year. Improvements to the street include added accommodations for pedestrians, bicycles and public transportation. “Oklahoma has made great strides on improving transportation infrastructure in recent years, especially fixing 70 percent of our structurally deficient bridges and reconstruction of our interstate system, which is benefiting our citizens and economy. Interstate 35 is an important corridor not only for the city of Norman, but also for the state of Oklahoma and the nation. Completion of the new I-35 interchange at Lindsey Street is the capstone of decades of work to improve this interstate corridor between Oklahoma City and Norman. I want to thank all of the federal, state and local partners who helped see these improvements to completion,” Governor Mary Fallin said. “The Lindsey Street bridge is the capstone on a great example of local, state and federal governments working together on infrastructure projects for Oklahoma. This bridge is the final step of a decades-long project that will increase access between Oklahoma City, Norman and all of the cities in between, supporting individuals and businesses. The successful completion of this project shows what will be possible as I work with President Trump and my colleagues on a broad-ranging and transformative infrastructure bill,” U.S. Senator James Inhofe said. “ODOT is thankful to the City of Norman and University of Oklahoma for working with us to make the new I-35 interchange at Lindsey St. in Norman a very safe, modern and unique piece of infrastructure. Transportation leaders who came before us had a vision for a better I-35 corridor between Oklahoma City and Norman and the good partnerships between the state and local stakeholders helped that vision finally become a reality,” Secretary of Transportation and ODOT Executive Director Mike Patterson said. “The Lindsey Street bridge truly serves as the gateway to the University of Oklahoma. Completion of this project marks an exciting and proud moment of achievement for the university, city and state,” OU President David L. Boren said. “We are so excited about the dedication of this beautiful new bridge. 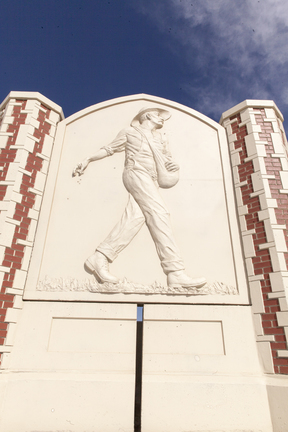 With the OU-themed aesthetics, it presents a welcoming entrance to Norman, in addition to providing much improved access,” Norman Mayor Lynne Miller said. “This is a monumental project whose dedication signifies the completion of decades of commitment to the Norman community. What started at US-77 with work all the way to the river bridge and now completed on Lindsey St., is a commitment to infrastructure like no other. Norman’s part of I-35 serves as an arterial to move the life blood of our local economy while safely transporting our families in their daily lives. Our community’s fortunes are tied to this highway and with its renovation, Norman’s best days lie ahead,” Norman Chamber of Commerce President and Chief Executive Officer Scott Martin said. Current and former officials unveiled public artwork featuring The Seed Sower during a dedication of the new Lindsey St. bridge over I-35 in Norman hosted by the Oklahoma Department of Transportation Friday. Pictured from left are former Secretary of Transportation Neal McCaleb, Norman Chamber of Commerce President and Chief Executive Officer Scott Martin, University of Oklahoma President David Boren, Norman Mayor Lynne Miller, Gov. Mary Fallin, U.S. Sen. James Inhofe, Secretary of Transportation and ODOT Executive Director Mike Patterson and former Secretary of Transportation Gary Ridley. 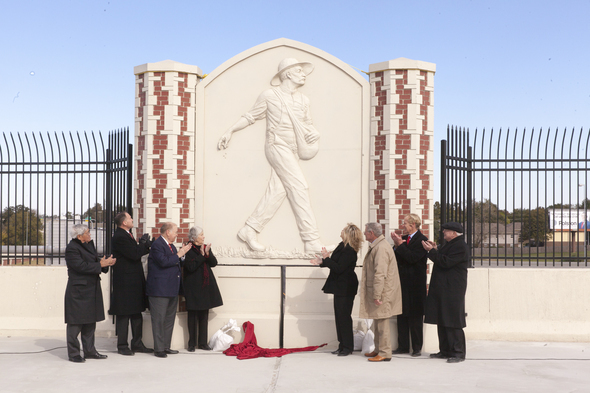 Unveiled artistic panels on the new Lindsey St. bridge over I-35 in Norman feature The Seed Sower, the iconic central figure of the University of Oklahoma seal who serves as a reminder of the importance of sowing the seeds of knowledge to bear fruit in the future.